We want our families and communities to thrive, and, in order for rural places to succeed, rural communities need to be places that families want to live. One good sign that rural communities continue to be attractive places to live is that many new families are settling down in rural counties, according to recently released American Community Survey data. Rural and mixed-rural counties grew by 3.3 million people since the 2009 data set*. But who are these new residents, and how can we help them feel at home? Increasingly, rural America’s new neighbors are Hispanic/Latino. While only a small percentage of Americans living in rural and mixed-rural counties are Hispanic–12%–they make up a large number of new families moving and being born in rural places. One-in-two of America’s new rural neighbors are Hispanic. Put differently, that is 1.5 million new Hispanic residents over a two year period. According to ACS 5-year-estimate data, 1.5 million Hispanics/Latinos moved or were born in rural and mixed-rural counties (between the 2009 and 2011 releases of the surveys). Click the image to see how rural Hispanic populations are changing in each state. RuFES data indicates that in seven states outside the Southwest, Hispanics accounted for more than 50% of new rural/mixed-rural residents: Michigan, Connecticut, Kansas, Oregon, Massachusetts, Nebraska, and Washington. In another fifteen states outside the Southwest, Hispanics accounted for more than one-third of newcomers: Kentucky, Florida, Mississippi, Iowa, New Hampshire, Wisconsin, Arkansas, Maryland, New York, Illinois, Delaware, Pennsylvania, Alabama, and Idaho. One challenge, according to the USDA report, is that many new Hispanic residents are undocumented immigrants (often times from rural communities in depressed regions in Mexico) who may have a hard time finding work or accessing social services. The report notes that “residential separation” between non-Hispanic Whites and Hispanics is increasing in rural counties, meaning that new immigrants live in areas disconnected from rest of their community. This disconnection from community and civic life means that new immigrants may have a harder time accessing the jobs, services, and support networks they need to enter the economic mainstream. The success of rural communities now depends on the success of this growing number of Hispanic–largely immigrant–families. A growing initiative called Welcoming America has stepped up to address some of these challenges by helping communities develop immigrant integration plans. Their “Receiving Communities Toolkit,” developed with the help of the Spring Institute for Intercultural Learning, walks communities and organizations through the process of building relationships between long-term residents and their new neighbors. It is through these relationships and trust that immigrant families are able to successfully integrate into their new communities and connect to the broader economy. You can download a copy of the Receiving Communities Toolkit here. You can also read more about the Welcoming America initiative here. 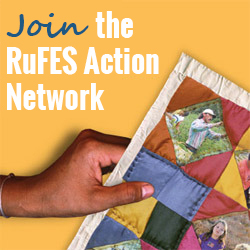 Want to learn more about welcoming immigrants to rural places? Watch Welcome to Shelbyville, a 2008 documentary about welcoming Somali immigrants to a town of 4,700 residents in central Illinois.